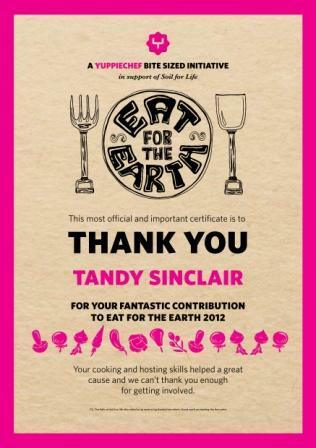 The Eat For The Earth initiative from yuppiechef is being held for the second year running. I hosted a meal on World Environment Day and made a donation to Soil for Life. If you would like to make a donation of any amount then please click on the link above and do so. In real money terms, €10 (R100) can make a difference! The aim is to raise R100 000 to change the lives of 50 men and women. Soil for Life is a Cape Town-based Non Governmental Organization. It teaches people how to build the soil and grow healthy plants so that families can sit down to plates of safe, fresh nutritious food at night, all year round. The low-cost methods enable gardeners to harvest large amounts of food from small spaces using very little water and no harmful chemicals. I was very inspired this year to approach my dinner from a different perspective. I love oxtail, and it used to be a cheap cut of meat. It was considered the ‘leftovers’ and until quite recently was not a popular part of the animal. My Curry book has a recipe for Karé-Karé (page 198) which refers to oxtail as offal. I don’t think of it that way, as I love it! This dish originates in the Philippines and uses peanut sauce for the vegetables. It is traditionally accompanied by a dried shrimp relish but we ate it without any chilli seasoning. I have adapted the recipe for the braised oxtail with peanut sauce for various reasons but mostly to suit my style of cooking. This inspires me to try oxtail, which I’ve really heard very little about. Thanks! the initiative sound slike a very worthwhile project Tandy, well done for promoting and supporting it! I too LOVE oxtail but have never made it with peanut sauce – not sure I would somehow and I definitely do not think of it as offal either. I made Braised Oxtail just recently (blogged it, too!) and I agree with you – it’s very moreish! The peanut sauce is a new tangent on an old idea and if ever I’m moved to make Oxtail again, I’ll have to try to remember it and come back for a reminder! 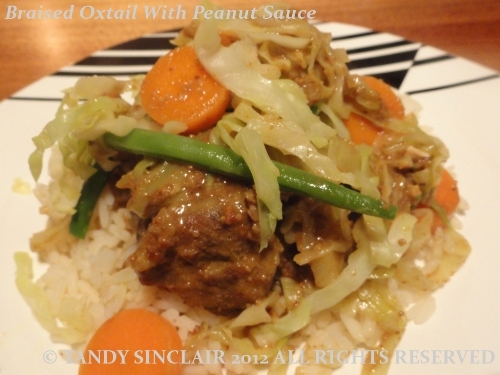 I love oxtail but have never had it with peanut sauce – sounds wonderful! we ate a kilogram of meat between three of us! Easily done when it tastes so good! Tandy this was really superb, that peanut sauce with the oxtail was not something I would have thought to cook up but it worked like a bomb. 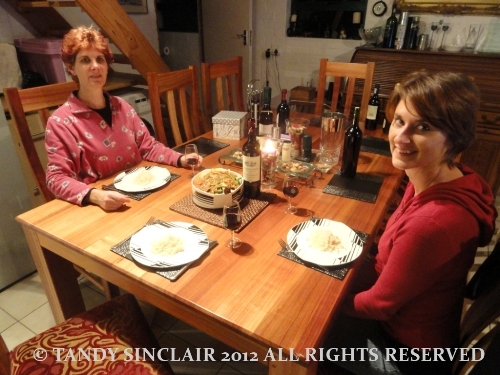 The Vergenoed red worked amazingly well with the caramel cake, all in all a fantastic meal! Delicious!!!!!!! Such great flavour combinations.